As the ripple of sorrow went through our souls on Friday, most of us could only ask “Why.” Why would someone feel the need to murder children? Why were they taken from this world so soon? Why would a Mother be fated to die by her own son’s hands? Why would teachers need to take on the task of life-savers within an elementary school, of all places. Why. As the “whys” swam through my mind, I sense my panic rising. My PTSD was daring to show it’s ugly face and I couldn’t handle having my children seeing me in that debilitating roll. By 2pm, all I wanted was my son to get home from school so I could hug him and never let him leave my sight again. So I could silently cry in the dark of our living room, while we all cuddled and watched a Disney movie. I got to do just that and around 7:30, my mind and body was so exhausted from the day that I went to sleep. The next day I couldn’t help but watch the news and see the many stories of the teachers that saved young lives while risking their own. They were the definition of protector, and I remembered all of the teachers, whether they were mine or my son’s, who have changed our lives. I dedicate this video to them. Please watch; it’s not long, but it’s very meaningful to me. 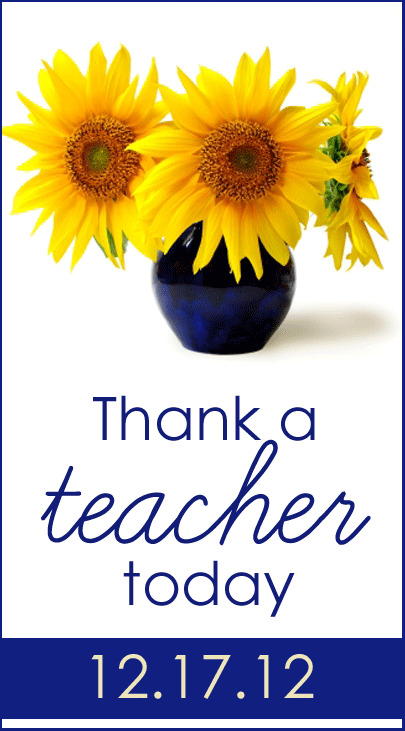 —Please take a moment on December 17th to thank a teacher. Whether it’s by way of a bouquet of flowers, a card, or even a hug, let them know how you feel. Visit http://julieverse.com/thank-a-teacher-day-december-17-2012 to find out how you can be part of this campaign.